What’s the best exercise for weight loss? Most people tend to think along the lines of long slow jogs, aerobics-based classes, or even something like yoga. But the right answer is strength training. Of course, all exercise is good for you. But strength training has the highest impact if you want to look better. Although cardio exercise depletes more calories, it is not usually enough to make much difference. But weight lifting will lead to muscle growth. This leads to increase in your basal metabolic rate. So you end up spending more calories per day, even during rest periods. When your muscles are toned, you look slimmer and better. You will notice the difference even if you are still carrying excess body fat. Strength training is the most misunderstood type of exercise amongst women. They worry that lifting weights exercises will make them “bulky”. That’s complete nonsense! Muscle growth requires huge amounts of testosterone, which women don’t have in sufficient quantities. Female bodybuilders spend a lot of money on hormonal supplements in order to look the way they do. Not to mention rigorous exercise routines that are more like those of Olympic athletes, rather than your average gym-going lady. And before you think of Madonna and her biceps, remember that she spends four hours a day at the gym! If you are a woman and would like to lose weight, strength exercise will not make you bulky. But it will give you a great shape, boost your metabolism and help you lose weight faster. Building muscle requires a lot of extra energy for the body, on top of its usually daily supply – so more calories need to come via food. Bodybuilders eat 2 and 3 times more than an average non-athletic person of their height and weight would need. If you are also on a diet while you exercise, your body will simply not have enough fuel to build muscle. But doing strength workouts will help to ensure your muscle mass is not wasted during your diet, and will encourage your body to burn fat faster. Growing and maintaining muscles is hard work, which needs to go on continuously. Once you stop working out, your muscles start to shrink. So, in the extremely unlikely scenario of you becoming too bulky, all you would need to do is stop your strength workouts. Whichever way you decide to go, it is imperative to have an exercise programme in place. Typically, it will include a set of exercises to do each week, split over 3-4 sessions. Your programme should be developed based on your individual goals, fitness levels and available resources. As you progress, you can review and update your routine every 2-3 months. Correct technique is very important. – do some research or get professional advice before embarking on a strength training programme. It is important to know exactly what you are doing, otherwise it might do more harm than good. Compound exercises require more than one muscle group in order to complete the movement. This is the best type of strength exercise if your goal is overall fitness and strength. They will have a great effect on your metabolism and will encourage fat burning. You could achieve great results with a weekly routine that only incorporates the above exercises. You could add more isolated exercises, such as bicep curls, to your routine if you wish to work specifically on that muscle, but it’s best to always to do at least one or two compound exercises as the main part of your routine. Free weights are hand-held and not attached to any machine. The most common types are dumbbells, barbells and kettlebells. You can perform a full range of strength exercises for all your muscles using just free weights and nothing else. They are relatively compact and are not expensive, and so are perfect for home exercise. 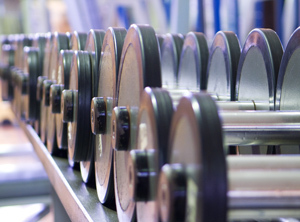 Working out with free weights is the best way to develop strength and build muscle. Free weights involve multiple muscle groups to keep the balance and the correct range of motion – unlike weight machines, which isolate one or several specific muscles. There are hundreds of gym machines out there. Gyms will typically have at least one or two machines for each muscle. If you are not sure how to use them, ask a member of gym staff to help you. Weight machines are usually large, highly specialised, and are too expensive for a household budget, so not really a suitable option for home exercise – you will need to go to the gym to get access. Finally, there are exercises that you can perform effectively just using your own body weight (these are often referred to as calisthenic exercises). If you are a complete novice, this type of exercise will be more than enough to start with.